Electronic Master EMHD8212 High Quality HDMI Cable can enhance your TV watching experience. This HDMI cable delivers incredible picture quality and digital surround sound for your entertainment, it supports most screen resolutions and refresh rates. so you'll enjoy virtually blur-free fast action scenes and eye-popping image quality. Electronic Master EMHD8225 High Quality HDMI Cable can enhance your TV watching experience. This HDMI cable delivers incredible picture quality and digital surround sound for your entertainment, it supports most screen resolutions and refresh rates. so you'll enjoy virtually blur-free fast action scenes and eye-popping image quality. The optimum connection for equipment with Component Video capability. Three separate cables carry Red, Green and Blue picture information, providing a superior viewing experience and delivering the sharpest, clearest, most vibrant picture possible. Provides maximum signal transfer and superior connectivity for TV/HDTV, DVD players, satellite receivers and video projectors. Supports1080i High Definition Digital Video Sources. Precision-machined connectors deliver superb picture resolution. Special four-layer Shielding offers superior protection against EMI (electromagnetic) and RFI (radio frequency) interference. Colour-coded connectors for easy hook-up. Three shielded cables carry video and right and left audio signals separately. Universal compatibility for A/V signals from TV, DVD players, satellite receivers, video cameras and projectors etc. Platinum Link has been engineered to remove signal distortion commonly found in lower grade video cables. Precision-machined connectors deliver superb picture resolution. Special four-layer design offers superior protection against EMI (electromagnetic) and RFI (radio frequency) interference. Colour-coded connectors for easy hook-up. 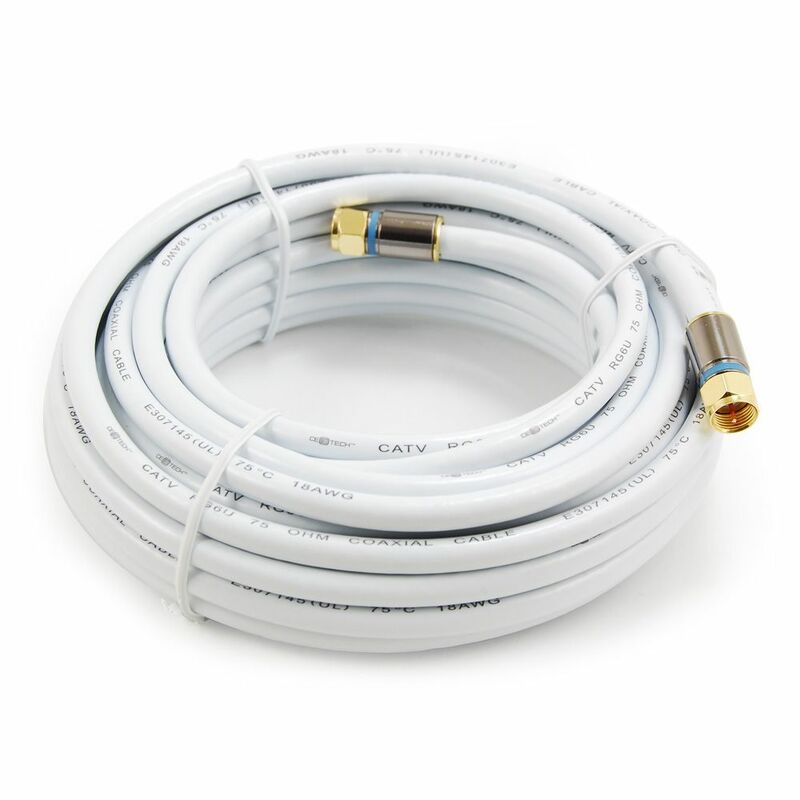 25 ft. RG6 Coaxial Cable in White The RG6 coax cable is used for CATV-community antenna television and VCRs and CCTV-closed-circuit television. It uses F-plugs to connect on both ends. It features low-loss, double shielding which ensures less interference in your picture and sound. 25 ft. RG6 Coaxial Cable in White is rated 4.8 out of 5 by 44. Rated 5 out of 5 by ckw from I accidentally cut my cable to my satellite dish and... I accidentally cut my cable to my satellite dish and needed to replace it. Made some calls and was told only a cable repair person could replace the cable. Came into Home Depot and they said, yes, we have it right here. It was the exact cable and did the job and the best price! Rated 5 out of 5 by stlblond from It extended my cable 25ft...just like it said it would.... It extended my cable 25ft...just like it said it would.